What does the British classic rock band have to do with 9/11? Nothing ... or everything? "Breakfast in America" is a 1979 record by the British rock group Supertramp. Its cover artwork features a smiling waitress who is standing in for the Statue of Liberty. * Behind her stands the New York City skyline, including the twin towers. It's weird. According to the latest theory from the 9/11 truther community, however, Supertramp's album cover was never just a jokey little piece of absurdist art. What was it instead? A prophecy of doom. Try to follow us on this one, because as one might suspect from a new 9/11 truth theory provided today (some 10-plus years after the attacks), things get a bit complicated. The Supertramp theory, if we can call it that, is derived from the brain of one member of an online forum for David Icke (he of the evil lizard overlords theory) named "Eve." 9/11 was served with breakfast ... not to mention the everyday fight for freedom: "Breakfast In America." You are looking out of the window of a plane, she is showing the target. So, yeah, there you have it. The case, as best as Eve can make it, that Supertramp ... knew 9/11 was coming? 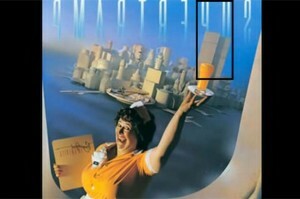 Or that whoever picked the album cover for Supertramp knew 9/11 was coming? Questions remain — but the search for knowledge continues. *Readers noted that rather than riding the wing of the plane, as this post said initially, the woman featured on the cover of "Breakfast in America" is supposed to be replacing the Statue of Liberty. This makes (slightly) more sense, so I've updated the post.